Kranj mayor Bostjan Trilar said it was highly appropriate to have the monument in a city which "is tightly connected to modern technology companies"
The Slovenian town of Kranj has inaugurated one of the world's first monuments honouring crypto currencies and block chain technology as a display of the country's openness to new technologies. "We're sending a message to the world that emphasises our openness to digitisation, susceptibility to the use of new technologies and hospitality towards progressive thinking," the Kranj municipality, some 30 kilometres (20 miles) north of capital Ljubljana, said in a statement. 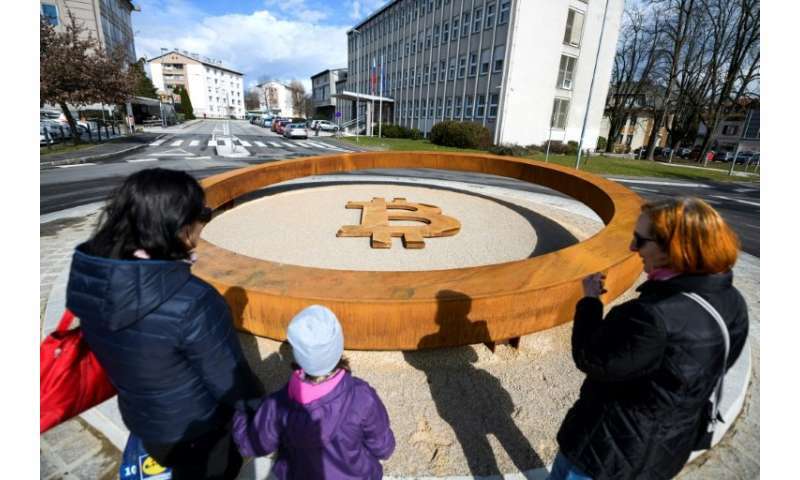 The construction of the monument—placed in a roundabout at Kranj's city centre—was financed by two blockchain technology companies, including Luxembourg-based bitcoin-exchange Bitstamp. At the inauguration ceremony on Tuesday, Kranj's mayor Bostjan Trilar added that the town of some 37,000 inhabitants "is tightly connected to modern technology companies, some of them have been successful precisely with the blockchain technology and we thought it was right to honour them." The monument consists of a horizontal seven-metres wide weathering steel ring with the bitcoin "B" logo in its centre. Slovenia, a tiny central European Alpine state, is the home of several block chain companies including the NiceHash marketplace company that became known to the wider public when it reported a security breach resulting in the theft of bitcoins during last year's surge of the digital currency's value.